Always present since prehistoric times, honey is mentioned in lots of ancient and modern literature works. In fact, it is mentioned in Hammurabi’s Code, as food of the Gods in ancient Greece, as food and condiment in Roman times and as an excellent unguent for other peoples. Massive quantities of honey are harvested in the Abruzzo region, specifically in the village of Tornareccio, with the technique of nomadism: farmers and swarms move from one place to another seeking for the best plantations, in order to harvest a wide quantity and variety of monofloral honey. 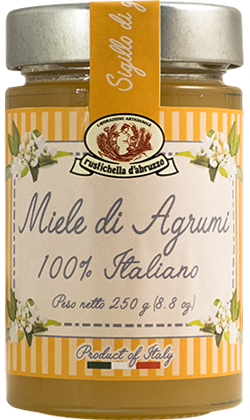 More than ten types of honey are harvested: the typical ones from Abruzzo are Acacia, Sainfoin, Savory and Multi-flower. All the others, such as Orange, Chestnut, Cherry, Coriander, Eucalyptus, Sunflower and Jerusalem Thorn, are harvested in the nearby regions. 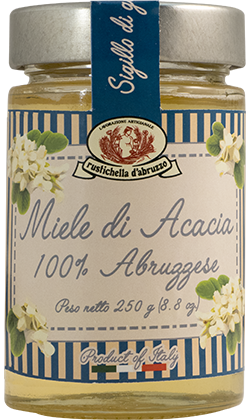 Rustichella d’Abruzzo Acacia Honey has a delicate and refined taste that reminds the one of a confetto (typical sweet of Abruzzo), revitalising and anti-inflammatory properties. It prevents diseases of the digestive tract, stomach acidity and is liver-detoxifying. It is widely used in gastronomy: thanks to its high fructose content, Acacia Honey is the sweetening honey par excellence. It does not alter the taste of drinks; rather it enhances their fragrances and aromas. 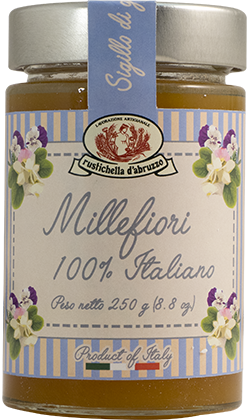 Furthemore, it is excellent when combined with spicy blue cheese, such as gorgonzola. 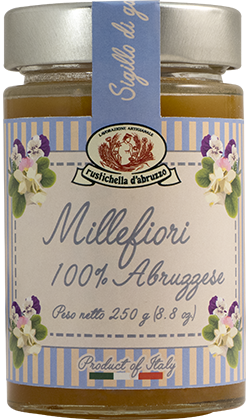 Rustichella d’Abruzzo Woodland Honeydew honey has a strong, plant-related taste. It reminds the taste of caramelised sugar and is particularly suited for flu symptoms. As for food combinations, Woodland Honeydew is very good when added on medium-textured cheese and dried and not to fat cheese. 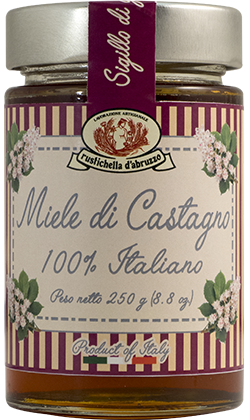 It tastes like cooked cane sugar: this is why the best way to use it is heating it in a bain-marie up until 40° and serving it on fresh ricotta cheese as dessert. 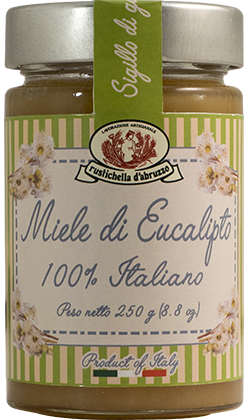 Rustichella d’Abruzzo Eucalyptus Honey tastes like malt and caramelised sugar and has an antibiotic, anti-asthmatic and anti-phlegmatic properties. It is also very useful to prevent cough. As for food combinations, Eucalyptus Honey is widely used for breakfast and extraordinarily pleasant when melted in natural yoghurt. It is the best honey to combine with savoury and slightly acid cheese. For instance, the combination with aged ricotta cheese is the best. 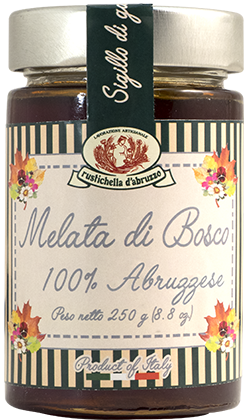 Rustichella d’Abruzzo Chestnut Honey has an intense taste with a slightly bitter aftertaste. It facilitates blood circulation and has anti-spasmodic, astringent and disinfectant properties, especially for urinary tract. Therefore, it is suited for the elderly and children. As for food combinations, Chestnut Honey has the highest content of mineral salts, so it is very well appreciated by sportspeople. 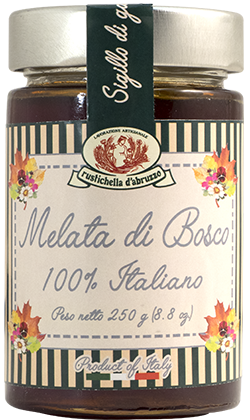 With its intense and balsamic smell, it is perfect when combined with Grana Trentino cheese, enhancing its natural sweetness, with fresh Pecorino cheese, Caciocavallo cheese, goat’s cheese and Parmigiano Reggiano cheese. 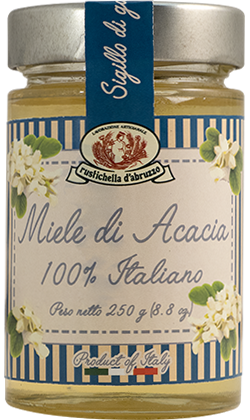 Rustichella d’Abruzzo Citrus Honey has an aromatic and pleasantly sour taste; it is perfect for healing over gastric ulcer and has anti-spasmodic and sedative properties. Particularly good to prevent insomnia and nervous excitation. It is very performing also in gastronomy: for example, you can obtain an amazing fresh drink by melting two spoons of Citrus Honey in a jug of water and adding lemon juice and a mint leaf. Furthermore, it is very good on Carasau bread (typical Sardinian bread), in the yoghurt or on fresh ricotta cheese.